That’s….amazing. 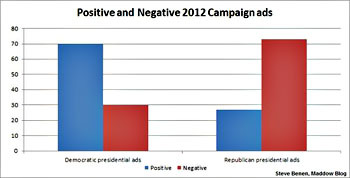 Not the fact that Democratic ads are 2:1 positive while Republican ads are 2:1 negative — exactly the opposite of the media spin you’re likely to hear these days — but the fact that the two campaigns have run 63,793 ads in six weeks. That’s 1,400 ads per day six months before the election. Yikes.